If you are going to make biscotti for the holiday season, let this Pistachio and Cranberry Biscotti be the one! It’s the best holiday biscotti! 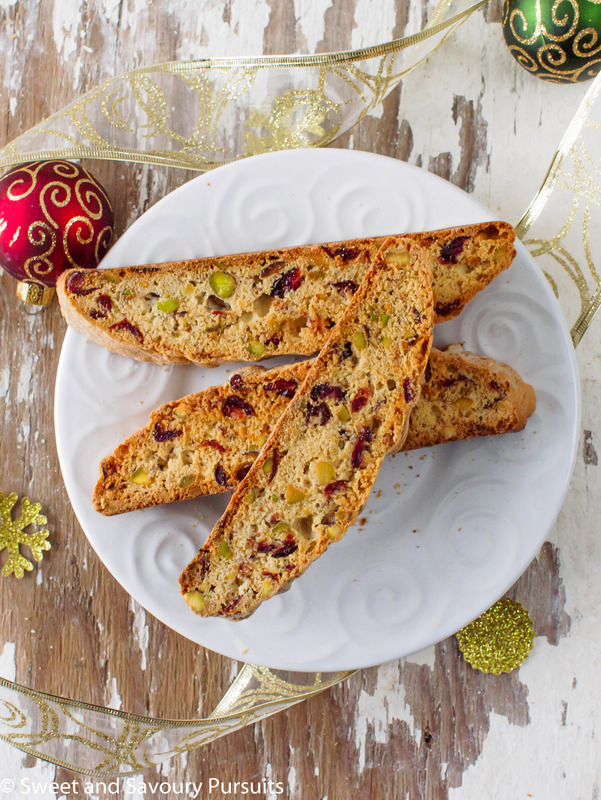 This recipe for Pistachio and Cranberry Biscotti was originally published in December 2014. Here’s an updated the post, recipe remains the same. This Pistachio and Cranberry Biscotti recipe is a holiday family favourite, not only is it beautifully speckled with green and red but it tastes absolutely delicious. What makes this biscotti recipe a winner is that it’s full of crunch without being overly hard, the cookies aren’t dry and remain slightly tender in the middle. Biscotti is an Italian cookie which is baked twice, this gives it a crunchy texture and makes it excellent for dunking into coffee or tea. Biscotti are made using a variety of dried fruit and nuts, are often perfumed with the zest of various citrus and can be coated with melted chocolate. With all these options available, you could easily adapt a biscotti recipe to suit your preferences and create all sorts of delicious biscotti. In fact, I adapted this Pistachio and Cranberry Biscotti recipe to make both this Hazelnut Chocolate Biscotti and this Apricot and Almond Biscotti with White Chocolate Drizzle. The original recipe for this particular biscotti is from America’s Test Kitchen. It called for dried cherries, but I used dried cranberries instead. I also added orange zest and doubled the quantity of ingredients since I wanted to make enough to give away as presents. To make this biscotti, you need to start by making the dough. Once the dough is prepared, you must divide it and shape it into logs. Place the logs on a baking sheet, keeping them well spaced apart and bake the logs for approximately 25 to 30 minutes, rotating the baking sheet halfway through the baking time for even cooking. Remove them from the oven, let them cool slightly and slice the logs on the diagonal before baking them a second time, flipping them over halfway through the baking time again so that both sides are evenly golden. I hope you find this biscotti as delicious as I do. By the way, this Pistachio and Cranberry Biscotti would make a wonderful hostess gift. Enjoy! Author: Adapted from America’s Test Kitchen, Best-Ever Christmas Cookies, 2014. With the rack in the middle position, preheat the oven to 350°F. Remove enough zest from one large orange to make 2 teaspoons, set aside. Squeeze the orange to obtain 4 teaspoons of orange juice. In a microwaveable bowl, combine the cranberries with the orange juice and microwave for about 45 seconds. Set aside. Add the vanilla, then the eggs, one at a time beating after each egg. Reduce mixer speed to low and add the dry ingredients, mix on low to combine and then and add the cranberries and pistachios and mix until the ingredients are incorporated into the batter, do not over beat. Turn the dough out onto a lightly floured surface and using your hands shape the dough into logs. Pat the dough so it’s about two inches wide. Place logs onto lined baking sheet, spacing them 3 inches apart, you may need to use two baking sheets unless you own a very large sheet. Bake for 14 minutes, rotate the tray and bake for another 14 minutes or until logs are light golden brown and beginning to crack on top. Remove from the oven and let cool on sheet for 10 to 15 minutes. Place one biscotti log at a time onto a cutting board and using a sharp serrated knife, slice the logs on a diagonal into 1/2 to 3/4-inch-thick slices. Transfer the biscotti onto a rack and let cool completely before serving or storing in an airtight container. That’s one of the things I love about biscotti, there are so many combinations of dried fruit and nuts that you can try. I told myself I would only have one of these biscotti, but then went back for another one! I couldn’t help myself. They are Delicious!!!! Thank you Christiane, I’m glad you like them. I like them very much as well. At the rate that I’m eating them I’ll have to bake another batch before Christmas! beautiful! and nice set up! Thank you Eleanore! Had lots of fun with it. Thank you so much! Let me know how you like them. OMG! They look absolutely perfect! Pistachios and cranberries together must be an amazing mix! Thanks for sharing this great recipes with us! Thanks and it’s my pleasure! It’s a ritual in my house to have a batch of biscotti home-made for Christmas. This year, i definitely will be trying your delicious and festive pistachio and cranberry version.. thanks for the idea! These sound just amazing! I love the idea of pistachio and cranberry together! Thanks Julie, they’re very good! This is a beautiful recipe, thank you for sharing! This biscotti sounds wonderful! It looks festive with the cranberries and pistachios in it! Thanks so much Nancy. Yes, I love the red and green colours.